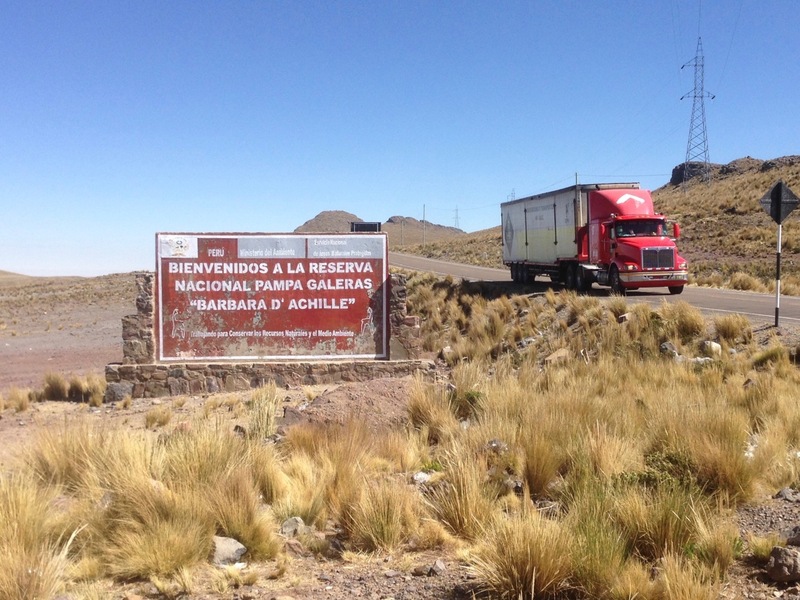 The entrance to the Pampa Galeras—Bárbara d’Achille National Reserve near Nasca. On the evening before climbing up the 90 km road from Nasca to the Pampa Galeras—Bárbara d’Achille National Reserve, one of Peru’s first national reserves, we were surprised by a visit from Jesús, a passionate guide and an expert on the Nasca region. He gestured us towards an old sofa in the hostel’s lobby, while he himself sat down in a chair in front of us; he wanted us to learn literally everything about vicuñas, the wild ancestors of llamas and alpacas we were going to see the next day. After revealing the secrets of vicuñas’ everyday lives, he told us the following story: until the 1990s, the vicuñas were the property of the Peruvian state—important not only for their natural and cultural significance (the vicuña is even depicted on the Peruvian national emblem) but also because they are lucrative, as vicuña wool is among the world’s most expensive wool. Two vicuñas crías at the rearing station of Pampa Galeras National Reserve. 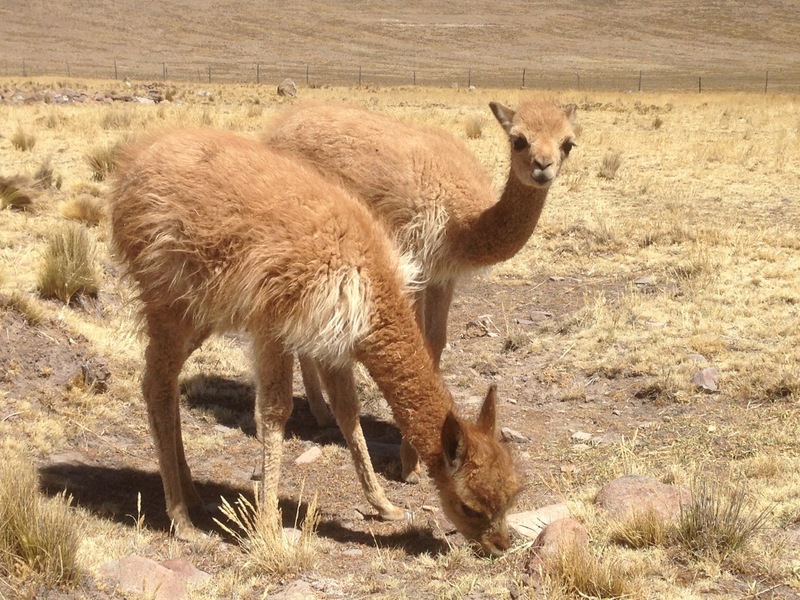 These two features made the vicuña a perfect target for the Maoist terror organization Sendero Luminoso, a “revolutionary movement” that aimed to destabilize the Peruvian state in order to take control of the country. The armed struggle between the Senderistas and the Peruvian state, leading to massive political violence from both sides, thus became a crucial part of Peruvian politics and everyday life in the 1980s and early 1990s. The massacres in Pampa Galeras, carried out by members of Sendero in 1983 and 1989, and the resulting closure of the reserve caused the death of more than 50,000 vicuñas. This enormous reduction in population majorly contributed to the Peruvian government’s decision in 1995 to sign over the property rights for the vicuña population to the Andean communities, with the aim of transferring the responsibility and incentive to protect the animals to these communities. This strategy can be seen as populistic, since it provided economic benefits for these communities, who play a major role in governing the countryside; but also as neoliberal, since it transferred economic responsibility away from the state in favor of “rural entrepreneurship” (Sahley et al.). Nevertheless, in Pampa Galeras, it also revived cultural bonds between humans and animals—e.g., the resuming of the Inca tradition of chaccu, the practice of collectively driving and shearing the vicuñas. This anecdote about the place which, since 1993, has been named “Bárbara d’Achille” reveals the constraints of “nature” at the time when d’Achille decided to write about it: a nature which is, on the one hand, deeply entangled in discourses of conservation and multispecies relationships, and on the other hand, in discourses of national and cultural identity and economy, of power, violence, and war—discourses that form unstable and sometimes even unexpected alliances. At the same time, it reveals the constraints of the writing and life of the reserve’s namegiver, the environmentalist and journalist Bárbara d’Achille, who dedicated both her life and her writing to Peru’s nature. D’Achille was an immigrant with European roots, a journalist for El Comercio (one of Peru’s most important daily newspapers), and a partner of numerous national and international researchers, NGOs, and important Peruvian conservationists, such as Peru’s first minister of the environment, Antonio Brack Egg, or the founder of Lima’s zoo, Felipe Benavides Barreda—in short, she was involved with Lima’s urban, “lettered” upper class. As such, her position in Peruvian environmental discourse may, at first glance, appear to reflect the values of this class. Indeed, after her death in 1989, numerous Peruvian and international newspapers and ecology publications painted a picture of d’Achille as a passionate but apolitical conservationist—an impression that manifests itself in two of her three posthumous publications that are dedicated to national parks and in perfect accordance with an international, state-friendly conservationist approach with little potential for political conflict. On the other hand, d’Achille does not seem to be an apolitical or subservient writer at all: she regarded her writing as stemming from her environmental activism, and showed interest in and engagement for “nuestro Perú,” a Peru that constitutes itself primarily outside of Lima; she took a stand against the problematic political system and criticized the Peruvians for their lack of civic engagement, as becomes clear in a series of articles published in El Comercio but not in the posthumous anthologies of her work. Finally, her death was highly political: she was murdered at the age of 48 by Sendero Luminoso terrorists while she visited a vicuña project in Huancavelica in the Andes, situated 250 km north of Pampa Galeras. Thus, d’Achille stood out in Peruvian environmental discourse of the 1980s, which was shaped by “a group of mainly biologists [that] started forming NGOs and supporting projects in and around protected areas” (Zinngrebe): she was the co-founder of El Comercio’s weekly ecology section, she was a self-taught environmental writer without an academic background, she traveled through the whole country and thus took a decentralized and decentralizing perspective that combines, amongst other things, the topics of international biology research projects with descriptions of the traditions of, and conflicts in, Andean peasant farming. She lived at a time when no popular environmental movement existed in Peru, as Chacon Pagan points out. Terrorism dominated the national and international discourse about the Latin American country. During this period, d’Achille became one of the first people to speak publicly about environmental topics that concerned Peru as a whole. Hence, taking a closer look at d’Achille’s writings not only means (re)discovering a fascinating example of Latin American environmental journalism, it also offers a starting point for exploring the complex history of the environment and environmental movements of 1980s Peru. Fixemer, Maria. “Environmental Writing in Times of Terrorism: The Peruvian Journalist Bárbara D’Achille.” Environment & Society Portal, Arcadia (Spring 2019), no. 10. Rachel Carson Center for Environment and Society. http://www.environmentandsociety.org/node/8498/. Collinson, Helen (Ed.). Green Guerillas: Environmental Conflicts and Initiatives in Latin America and the Caribbean. London: Latin American Bureau, 1996. D'Achille, Bárbara. Ecología 1. Lima: ARTE/REDA, 1989. D'Achille, Bárbara. “¡Hágamos algo!” El Comercio (Peru), 7 March 1989. D'Achille, Bárbara. Kuntursuyo. El Territorio del Cóndor, edited by Antonio Brack Egg, Marc Dourojeanni, and Walter H. Wust. Lima: Banco Latino / Ediciones Peisa, 1994. D'Achille, Bárbara. Uturunkusuyo. El Territorio del Jaguar, edited by Antonio Brack Egg and Walter H. Wust. Lima: Banco Latino / Ediciones Peisa, 1996. Forsyth, Adrian. “Bárbara d'Achille in Memoriam.” Tropicus (Winter 1990): 6–7. Palmer, David Scott. “The Revolutionary Terrorism of Peru's Shining Path.” In Terrorism in Context, edited by Martha Crenshaw. University Park: Pennsylvania State University Press, 2007. Chacon Pagan, Raul E. “El nacimiento del ecologismo popular en el Perú.” Ecología Política 24 (2003): 113–127. Lichtenstein, Gabriela, et al. “Manejo comunitario de vicuñas en Perú.“ PIE Series 2 (May 2002). Moffett, Matt. “Después de Sendero… a protoger vicuñas.” El Tiempo, 13 June 1997. Redacción El Comercio. “¿Quién fue Bárbara d'Achille?” El Comercio, 18 May 2017. Sahley, C., J. Torres, and J. Sanchez. “Neoliberalism Meets Pre-Columbian Tradition.” Culture & Agriculture 26, no. 1–2. Website of the Reserva Nacional Pampa Galeras Bárbara D’Achille. Maria Fixemer worked on a goat farm in France and studied organic agriculture at the University of Kassel before pursuing studies in literary theory and comparative literature (AVL) and philosophy at LMU Munich. As a master’s student in AVL and Environmental Studies, she is particularly interested in Latin American (nature) writing. This article results from a research trip to Peru that was intended to trace the environmentalist Barbara d’Achille’s steps in the historical archive of El Comercio and to visit the places to which d’Achille dedicated her passionate writing.